We have scaled back the number of pages on our site to make sure that you can easily access all of the different online resources that we offer. Let’s go through the webpages together so that you fully understand what’s available. The “home” page is the page that will come up whenever you go to “www.hoytlibrary.org”. Underneath the heading at the top of the page you will see that your page menu exists. The home page has all of the library’s contact information and our hours of operation for you to access. The “Search For Books” page is where you can access the Luzerne County Library System’s catalog. Here you can search for possible books, DVDs, CDs, magazines, etc… that you are interested in reading. The best part about the online catalog is that you can place holds on books that are available in the system and/or renew books that you already have checked out. The online catalog is one of the most convenient ways for you to find and access the library materials that you are interested in checking out. If you have any questions about using this tool, please call any of the librarians at the Hoyt! The “FrequentlyAsked Questions” page is where you can find a list of the most commonly asked questions that we are asked on a day to day basis. This list is always growing. Feel free to contact the library if you think this page should be edited. Soon enough the page will have categories where the different types of questions are grouped together in order to ease your use. The “Research” page is where you will be able to find the different information and research databases that are available to our patrons through our library and our county system. Underneath each of the links you will find a brief explanation of the services available for that database. The “Links” page is where you will find links to the other libraries in our county. Soon you will have links for other local/civil services and educational websites. Keep checking back. The blog is your current location. The blog is the place to check back for updates about the library, interesting articles, and other library news. A blog is a constant stream of updates in longer format. 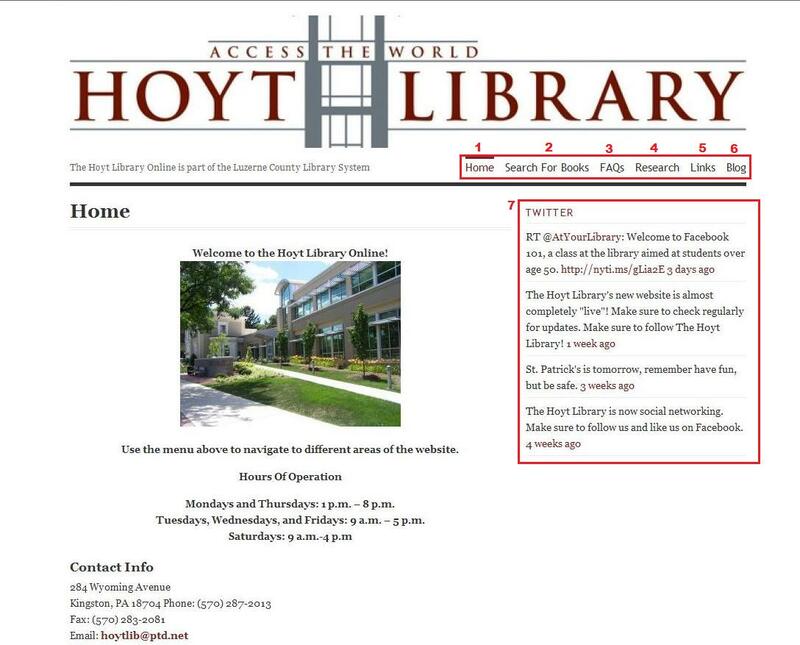 Think of the blog as the “news” page for The Hoyt Library Online. The Twitter feed is where you will find small updates about our library. Twitter is a social network that allows a person using it to connect instantly with other locations, people, businesses, news outlets, etc… across the globe. The Hoyt Library has it’s own Twitter “feed” (this is the word that means the constant update of information from a source). Every post (update) on Twitter is referred to as a “tweet”. One of the popular acronyms used on “Twitter” is “RT”. RT means Re-Tweet, which means that if you see this acronym you are seeing a post that someone else made and The Hoyt Library is re-posting for our patrons to see. Another popular symbol used is the “@” symbol. This simply means that you are seeing the “name” of someone on Twitter. This is how Twitter recognizes that there is someone/something that also has a Twitter account. For example, if you were to name the Hoyt Library in a Twitter post (a tweet), you would type @TheHoytLibrary. We’re sure that you will still have more questions, and the great thing about our new site is that we are constantly updating trying to make things easier for you. Make sure to check back soon. Most of these initial posts on our blog will be about using not only our webpage, BUT other online media as well! If you have any questions feel free to get in contact with us at The Hoyt Library using our contact information on the home page. This entry was posted in Blog by thehoytlibrary. Bookmark the permalink.